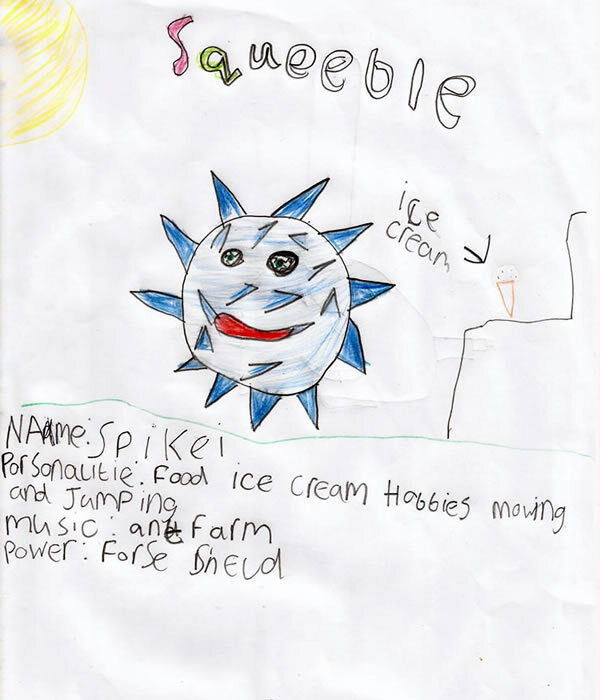 Caleb's mum sent us this amazing Squeeble, which Caleb created based on his love of science! We love that Amoeba contorts into a star when scared and that he has eaten so much swiss cheese that he even has holes in himself! Is there a danger that he could disappear entirely if he carries on eating?!! These are such curious and interesting traits that they make for a perfect Squeeble! 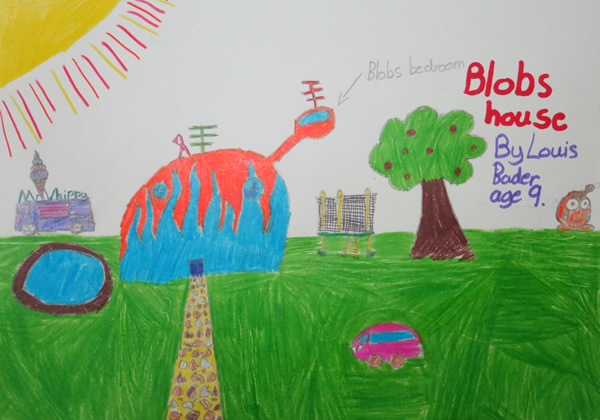 Caleb, we love your imagination! 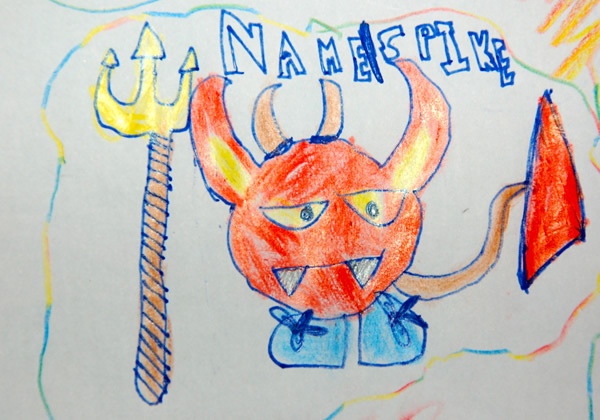 Thank you so much for sending in a drawing. 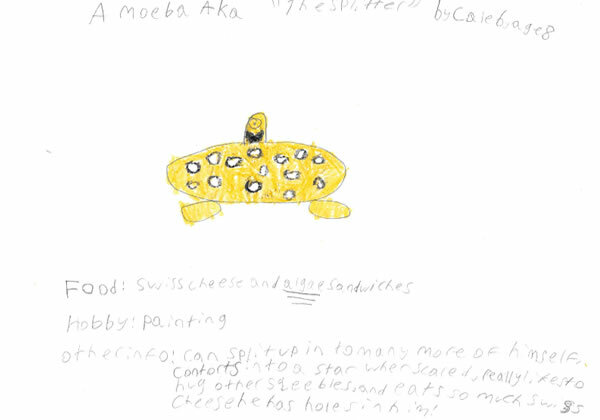 Harry's mummy sent in this beautiful drawing of his Squeeble, Bob, who is one of the most colourful Squeebles we've ever seen! 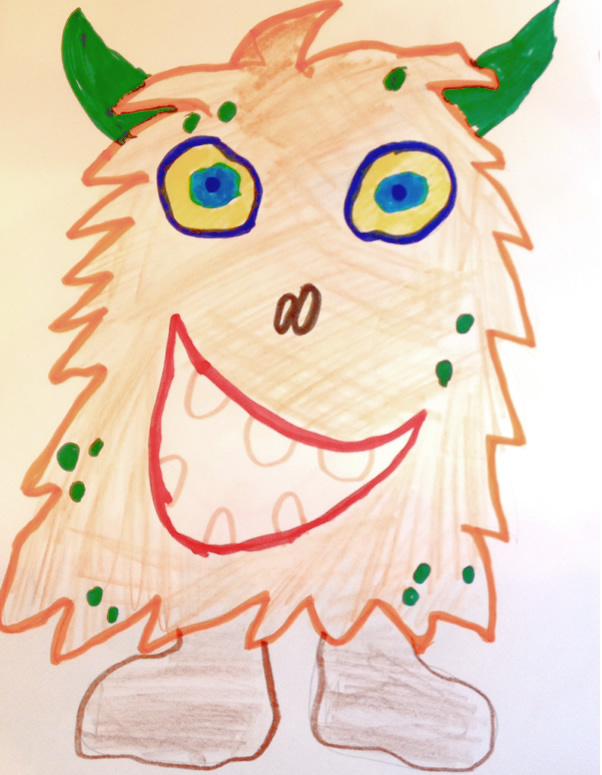 We love Bob's happy smile and spiky horns. Well done Harry!!! 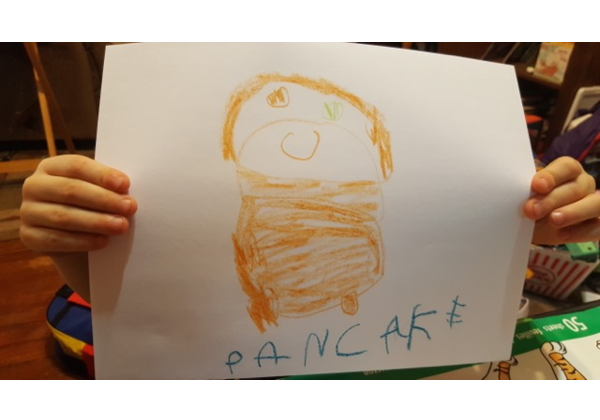 Holden sent us this picture of his wonderful Squeeble, Pancake, which we loved so much we just had to put it online! 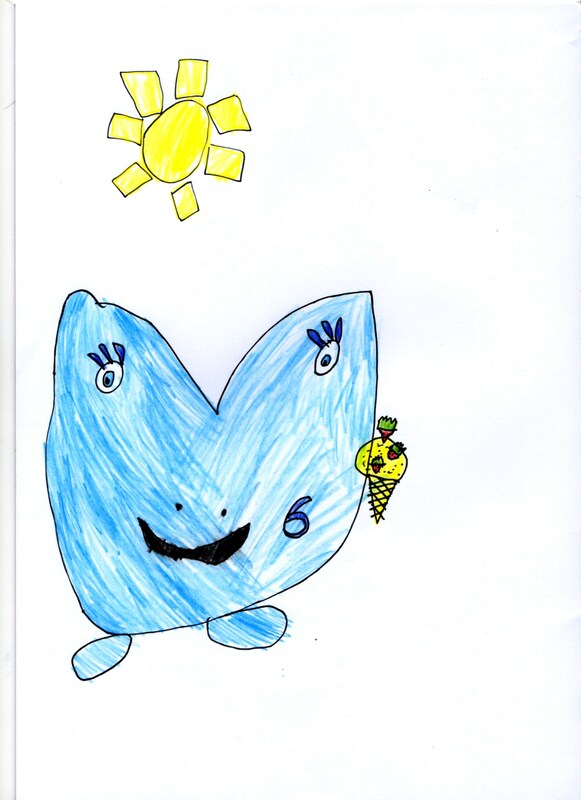 Marcello's mum sent this piece of artwork in to us and told us that Marcello is a huge fan of the Squeebles. It shows! 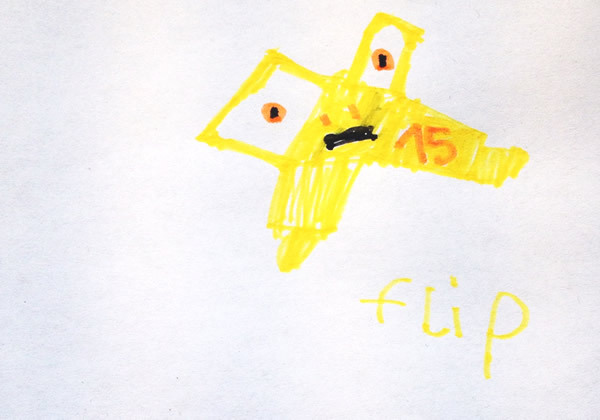 This looks exactly like Flip, right down to the number 15 on his body - a fantastic picture, Marcello! Anna says: 'This is Ruby's house. 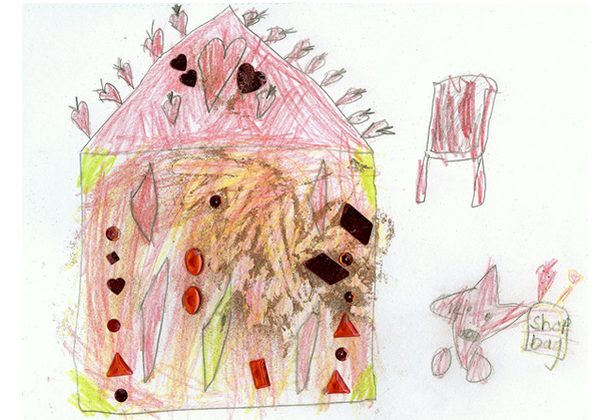 It will suit her because the house is covered in gemstones and has strawberries on the roof. I put glitter on the house to make it extra sparkly for Ruby. She likes to sit outside in her red deckchair with her shopping bag'. 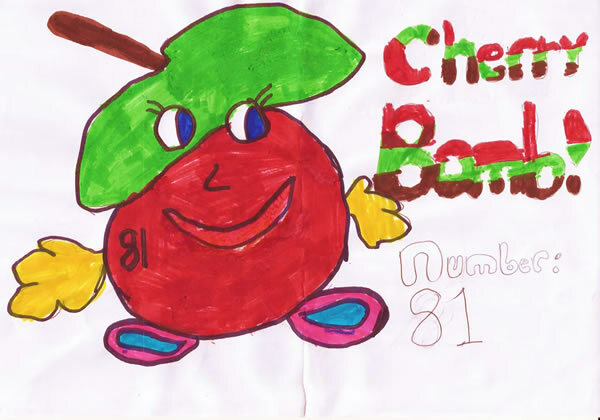 We don't know anything about Cherry Bomb, but we're hoping she won't explode and cover this page in bits of cherry! Thank you so much for your wonderful drawing, Candace. 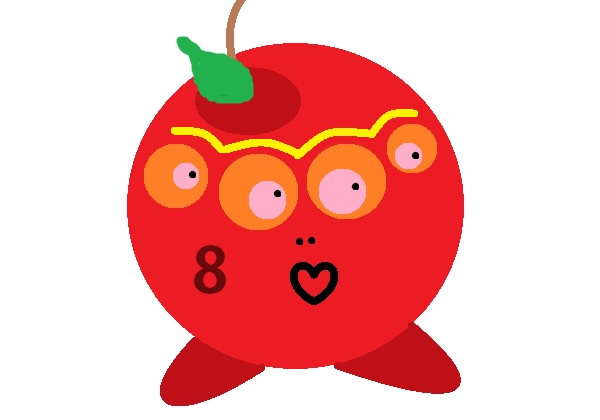 Lilac told us: Cherry doesn’t have a stone inside her, instead she keeps it in her handbag. She really likes red things, and she collects them and keeps them a big suitcase under the bed. What a wonderful idea! We always love to meet new Squeebles that enjoy extreme activities! What a wonderful collection of interests Handy Hand-glider has, Megan! 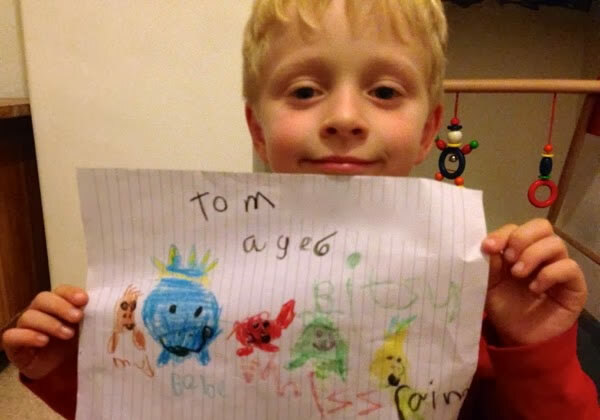 We love Tom's colourful drawing, which includes Mud, Bebe, Whizz, Bitsy and Raino! 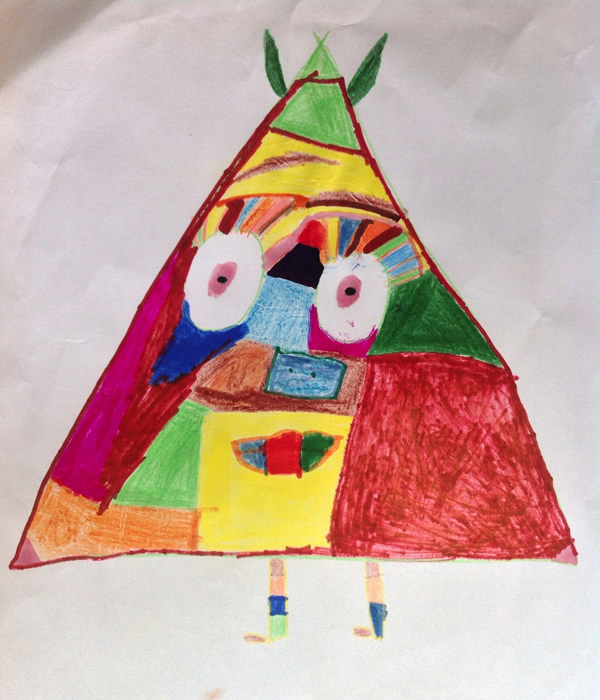 This drawing was sent in by Dylan's teacher, Mrs Munn. Apparently Roundy loves to play the drums! Edward told us: Squirl is very good at swimming, but is very scared because he thinks there are sharks in every swimming pool. He once swam across the Pacific Ocean in under 5 minutes, that's faster than a Jumbo Jet can! We love that Squirl is a mixture of vulnerability and supersonicity...even though we're not sure if that's a real word! 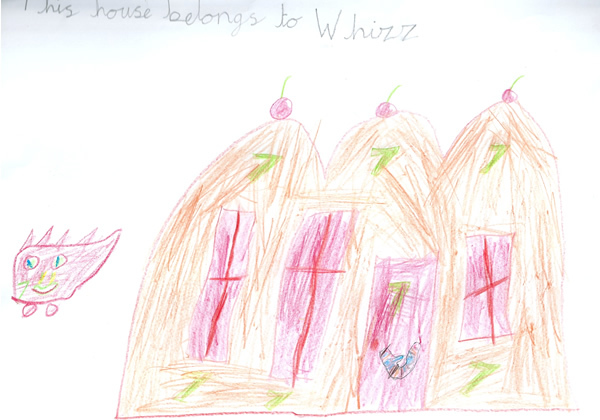 What more could Whizz want than a house with cherries on the top, a Squeeberang on the front door and the number 7 (his favourite number!) clearly marked all over it! This is quite possibly Whizz's dream house! Thank you for sending it in, Emily. We love that this gorgeous Squeeble looks like a heady mix of sun and moon (with spikes!). Spike apparently loves to jump up and down; he can't swim; and he is sharp! We love how colourful he is, Harry - especially his eyebrows! 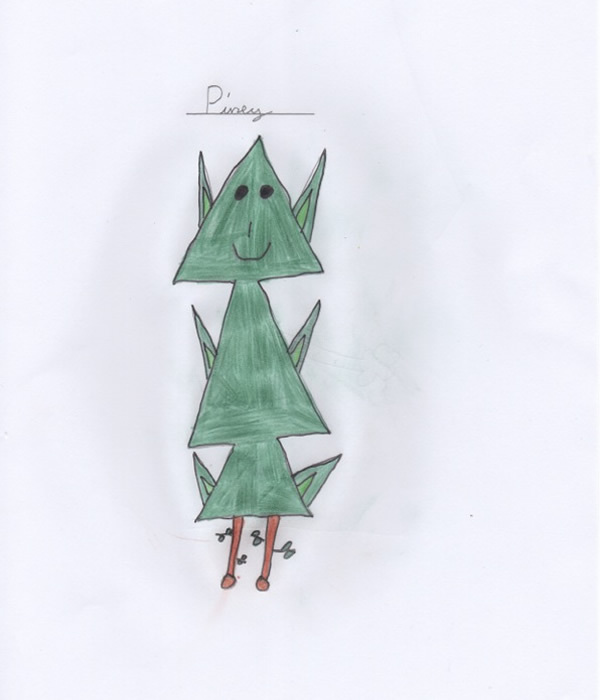 We can almost smell the delicious scent of a pine forest when we look at this drawing. What a wonderful idea for a Squeeble! 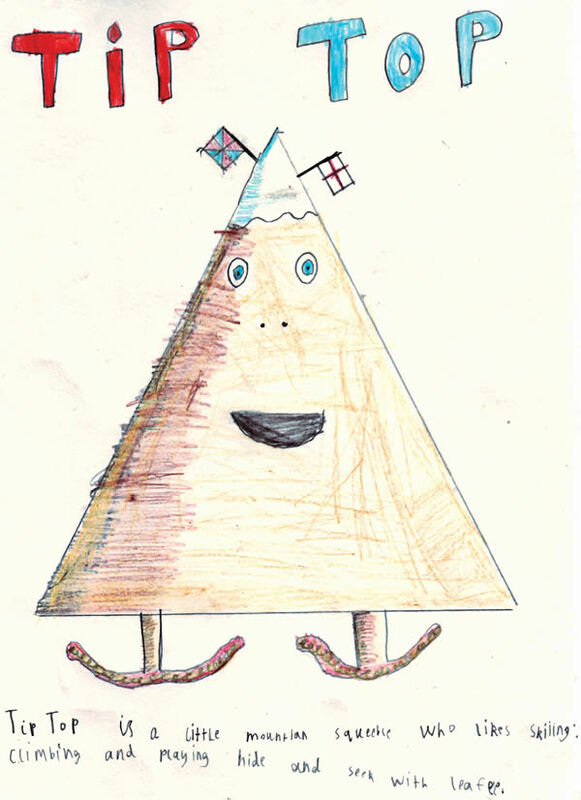 Spike actually looks scarier than the Maths Monster! Can this really be a Squeeble??? But apparently it is! 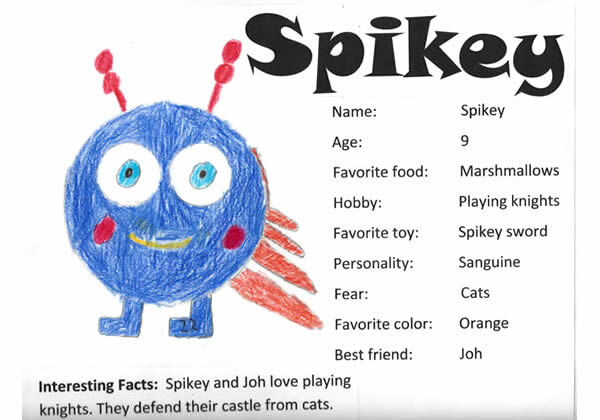 Frankie told us that Spike's favourite foods where chilli and death sauce and that his favourite hobby is cleaning his fangs until they're sparkling white! We feel terrified just looking at him! 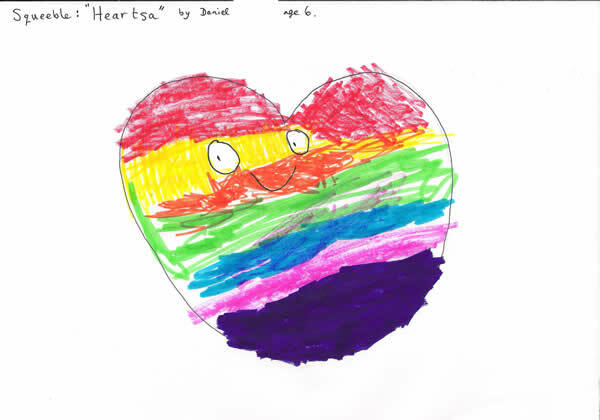 We've totally fallen for Daniel's rainbow-coloured, heart-shaped Squeeble. What a wonderful idea and so beautifully done. We think Daniel's strawberry ice cream looks so delicous that on the next sunny day we're going to have to try to recreate it! 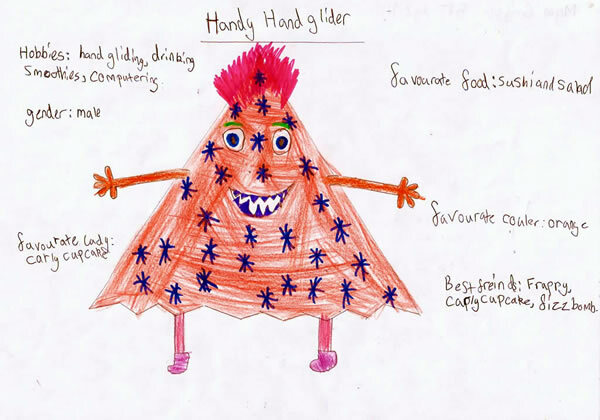 We think Nathaniel's idea for a Squeeble is amazing - a mountain, with skis for feet! 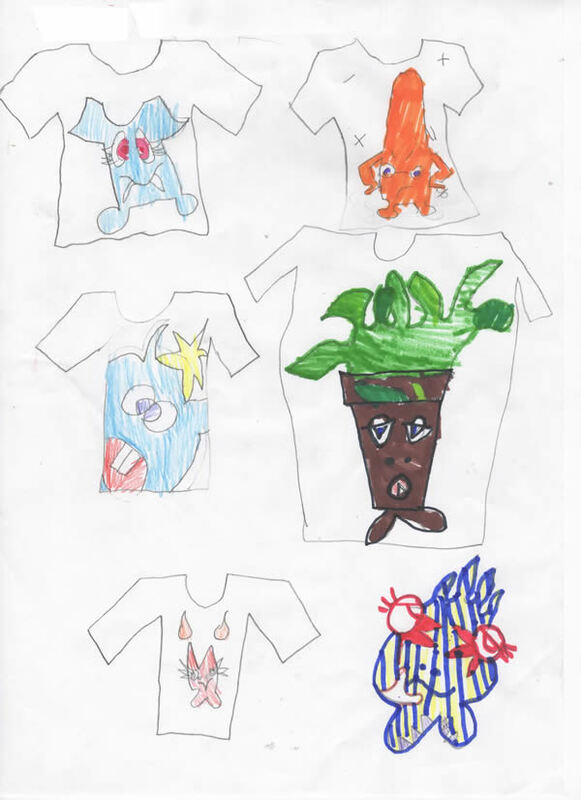 Look at these amazing t-shirt designs that Rupert came up with! We love them. 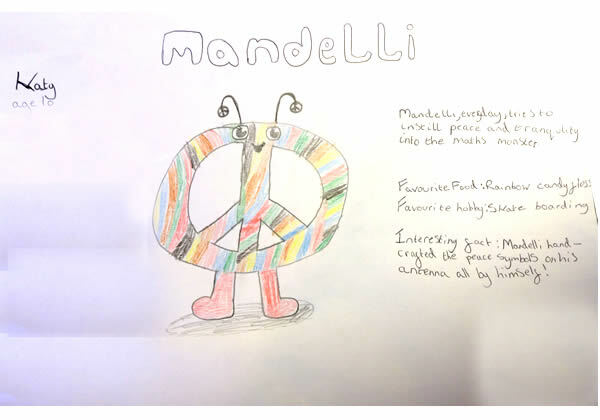 Katy wrote: Mandelli everyday tries to instil peace and tranquility into the Maths Monster. 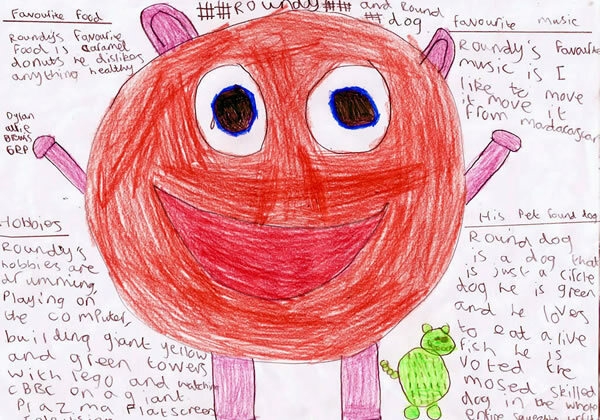 We were bowled over by this idea - we loved imagining Mandelli trying to reason with the querulous Maths Monster. Katy's whole concept - from the 'peace symbol' shape of her Squeeble, to the carefully chosen name, Mandelli - made us feel that she'd designed a really brilliant, well thought-out Squeeble. Zachary wrote: Spikey and Joh love playing knights. They defend their castle from cats. We didn't even know there was a castle on Squeeble Island, so we're delighted to find that it's hidden away somewhere awaiting discovery! You can't NOT love a Squeeble with a face like Mac's, can you?! 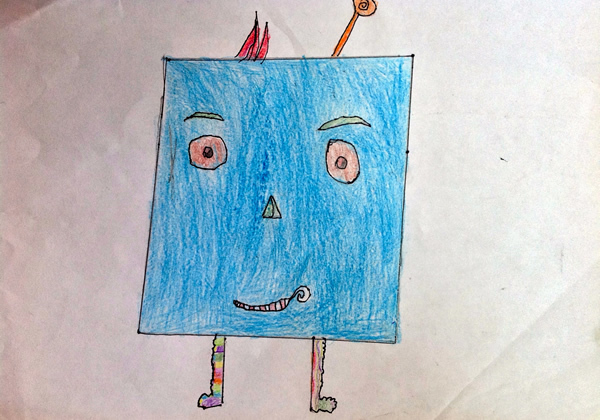 We love your design, Finn! We were delighted when these three-dimensional Squeebles, from sisters Elle and Brooke, landed in our inbox! They are the first 3D Squeebles we've ever recieved. We adore Brooke's cheerful looking Squeeble, who she has named Rainbow - just brilliant! 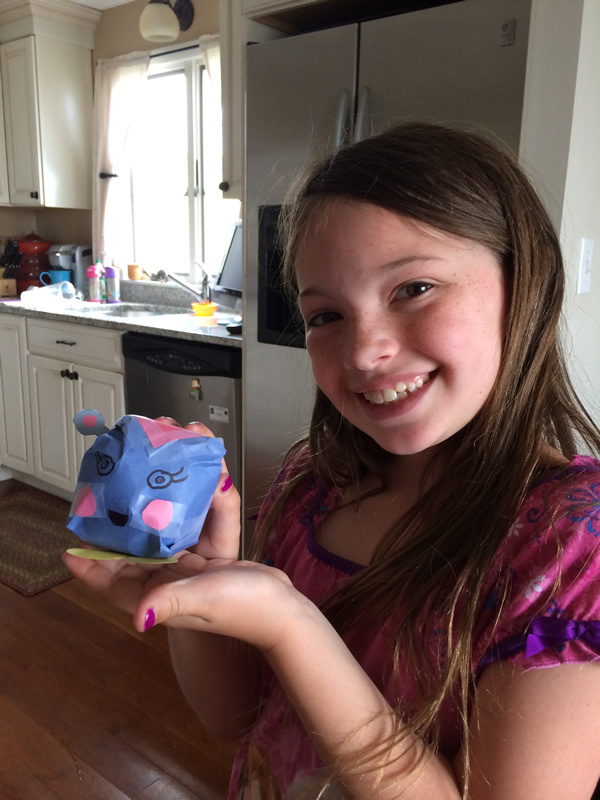 Thank you so much for sending in a photo of yourself with your Squeeble, Brooke! Juju, brought to life in 3D! Anyone who has ever tried to wrap up a football as a birthday gift will know just how tricky it is to cover a sphere, which is why we're so impressed by how perfectly-formed Juju (and her companion, Rainbow), looks when rendered in 3D! 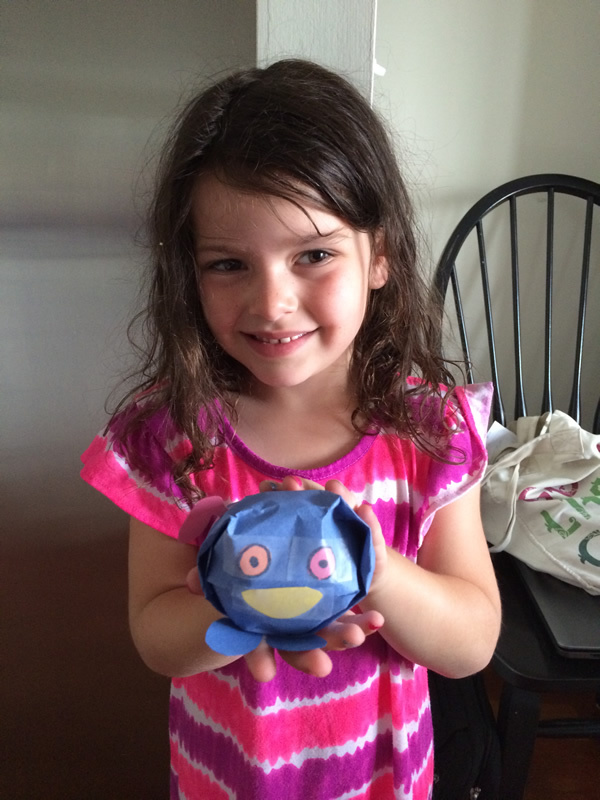 We also love all the details Elle has put into creating her Squeeble, especially the antennae and curly eyelashes! Great work, Elle! Vine, the Squeeble who loves to bounce! 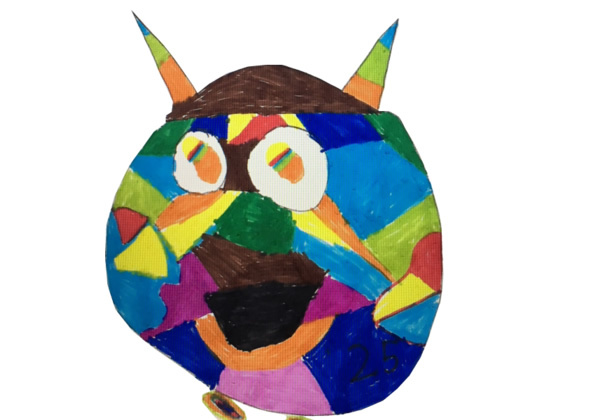 Shreyansh's mum sent us his wonderful Squeeble design. 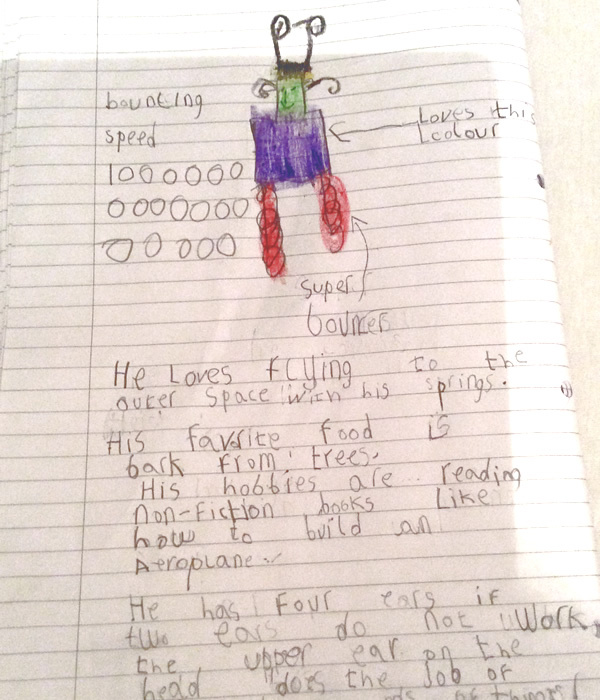 We think that a Squeeble with springs that could send him into outer space is a wonderful idea! We're also impressed with Vine's choice of reading material - he sounds like he'd get on well with Trig, who also likes to build things. And four ears in case the other two fail! What an amazing back-up plan for a Squeeble perhaps destined to spend his life around the engine noise of aeroplanes. Shreyansh: we love your ideas!